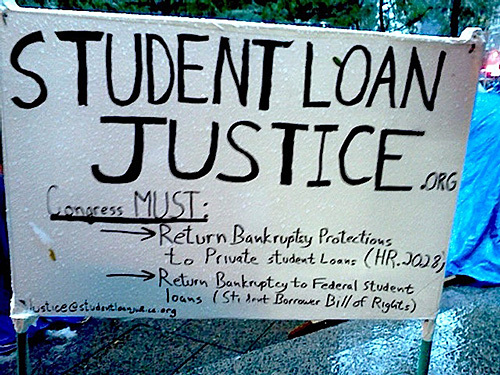 Student debt reformer Alan Collinge has brought a clear set of demands–and little patience for general assembly dickering–to Occupy Wall Street. He belongs to a large–but not unified–contingent of pragmatic policy wonks in the movement. 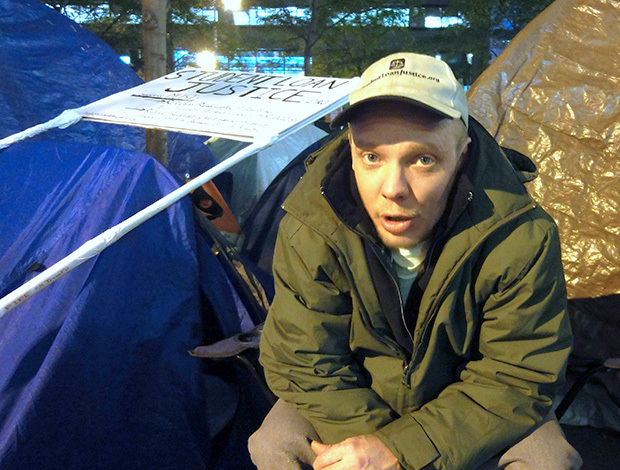 For two and a half weeks, Alan Collinge has been living on his political platform–a tent, actually, with a handwritten sign on it stating, among other things, that “Congress must” return bankruptcy protection to private and public student loan debt. It even lists a House of Representatives resolution number. His sign and all it stands for has survived the fierce wind, rain, and sleet of last Saturday’s early winter storm. Unfazed by the weather, Collinge spent 20 minutes explaining the injustices of legislation such as the 1997 amendments to the Higher Education Act and of the 2005 Bankruptcy Abuse Prevention and Consumer Protection Act. Among many things, the laws exempted student loan debt from federal bankruptcy protection. According to Collinge, no matter what their financial situation, Americans struggling under education loan payments have no way to escape the ever-ballooning debts. He’s actually not alone in his passionate specificity. Under the Occupy movement’s veneer of anarchism and radical inclusiveness hide several detailed, well-researched demands with their own constituencies. For Collinge, Occupy Wall Street is the latest step in a long journey. “For the past six years, I’ve been sharpening this blade,” he said. In 2004, when requesting a forebearance during a spell of unemployment, his $38,000 student debt suddenly ballooned to $80,000 overnight–and became due immediately–when the lender decided without warning to classify it as in default. Stung by that fate, he founded in 2005 Student Loan Justice to educate people about the predatory practices and rally support to overturn the legislation that made them possible. After two years, the cause became his full-time, unpaid job. “I said to myself, ‘This is my chance. This is my calling,&apos;” he recalled. By mid-2008, Collinge had blown through $35,000 in savings. He now lives on roughly $1,000 per month in donations from members of Student Loan Justice. That’s quite a sacrifice for a 41-year-old with graduate degrees in aerospace engineering and fluid dynamics. Despite the knocks, Collinge is taken seriously at even the highest levels, including working with the staff of then-Senator Hillary Rodham Clinton on a 2006 reform bill called the Student Borrower Bill of Rights Act. It didn’t get far in the Senate, but Collinge is now working with the office of Congressman Hansen Clarke of Michigan to produce a similar bill, which is just about complete. Collinge has also been a regular in the national press, including The Wall Street Journal, The New York Times, and Fortune magazine. He has won cred by doing his homework, much of it compiled in the 2009 book The Student Loan Scam. He’s also a key figure in Default: The Student Loan Documentary, which debuted this week on Colorado Public Television. On Tuesday night, Alan walked over to 60 Wall Street, an office building with a publicly accessible atrium where occupiers meet to plot the overthrow of firms like those on the floors above them. The Demands Working Group quickly swelled to around 40 participants gathered to discuss, among other matters, an actual, concrete demand. It’s a program named Jobs for All, calling for “a massive, democratically-controlled public works and public service program, with direct government employment, to create 25 million new jobs at good union wages.” A number of taxes and savings from military reductions would pay for the program. It hadn’t passed the General Assembly the previous Sunday, and they were discussing ways to rework it. But even within the group that had made it, the demand was contentious. The “corporate personhood” issue has been swirling around Occupy Wall Street since the beginning. This 19th-century interpretation of the Constitution grants corporations the same rights as citizens, including the right to make campaign contributions. Many people gave the disapproving, downward-wiggling-fingers sign to Theis, saying that it was off-topic to propose something new before discussing the jobs demand. But Alan Collinge said later that he had connected with Theis and might work with him on that issue. The logic isn’t apparent, but the Jobs for All demand also calls for saving money by restoring a 1933 law called the Glass-Steagall Act (partly repealed in 1999). It kept so-called “commercial” and “investment” banks separate, so the same company meant to keep savings of ordinary citizens and businesses safe doesn’t gamble that money in risky investments. Glass-Steagall popped up during the very first New York City General Assembly meeting on August 2 and has been kicking around ever since. The Jobs For All demand also calls for raising money from “new taxes … on financial transactions.” That’s the so-called “Robin Hood Tax,” another buzzword among many occupiers. About a half hour of the meeting was a heated discussion about politics in the movement. Luke Rudkowski, founder of news site We Are Change, complained of “a small minority, about 11 people, who are from socialist backgrounds” dominating that group. A woman (no name given) responded that all political beliefs should be welcome. She also charged that a “small, determined, fanatical minority” was using the GA process to block any concrete demand proposed in the General Assembly. Several people used the word “sophistry” to describe obstructionists. 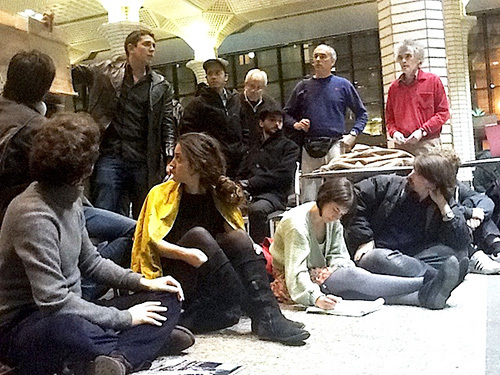 Back at Zuccotti Park, Alan Collinge shared what he thought of the meeting. Like several others in the Demands Group meeting, Alan said Occupy Wall Street has to put forward some of those no-brainer demands to win credibility, then work on harder issues like debating a federal jobs program. On his short list are reinstating Glass-Steagall, enacting the Robin Hood tax and, not surprisingly, restoring bankruptcy protection to student loan debt. That lineup hints at the challenge for Occupy Wall Street as a unified movement–and how unlikely it is to ever become one. Many specific demands exist, but the diverse participants have their own lists.